Toni Lucas and Chris Davis - Remembrance Day Ceremonies were held in Pincher Creek last week, at local schools on November 9 and at Pincher Creek Community Hall and Twin Butte Community Hall on November 11. 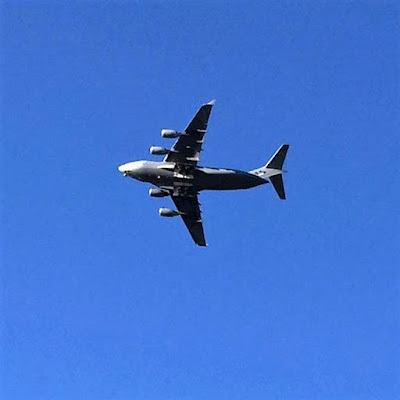 In addition to the ceremonies, on November 10 area citizens witnessed a flyover by a Royal Canadian Air Force C-17 Globemaster of the 429 (Bison) Squadron (which was adopted by the City of Lethbridge in 1944 while serving in England during the Second World War). It was flown by Department of National Defence pilot Steve Radvak. who grew up in Pincher Creek. 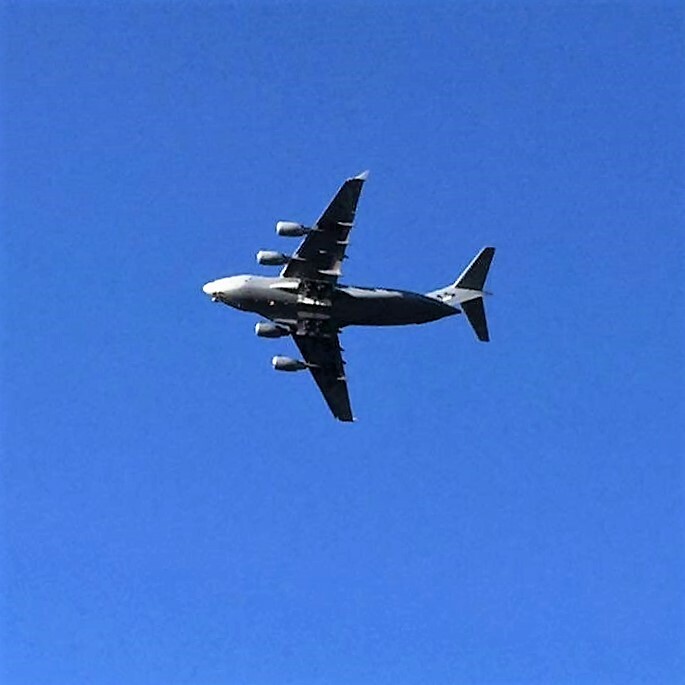 429 Squadron performed a flyover of the Lethbridge Cenotaph on November 11 as part of that city's Remembrance Day ceremonies. They travelled to southern Alberta from their base in Trenton Ontario for the event. According to Radvak they were also conducting a pilot training mission in the area. Pincher Creek Royal Canadian Legion #43 held their annual Remembrance Day Service on Friday, November 11, 2016 at the Pincher Creek Community Hall. The main and upper floors were full with people who came to pay their respects to those that have given their lives in the service of our country, and those who continue to protect our freedoms today. 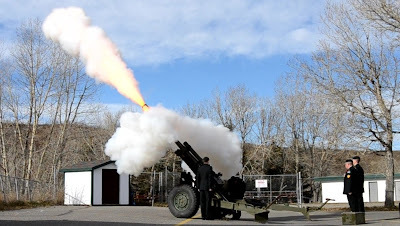 This year the moment of 11:00 am silence was marked by a blast from the large artillery manned by members of the RCA 20th Independent Field Battery out of Lethbridge Alberta, lead by Sgt. Anthony Laphorn. The guest speaker was retired Brigadier General Lawrence Aitken, who was attending with his wife, Major Carolyn Schrader, also retired. Everyone stood as the Colour Guard marched in, starting the ceremony. Jackie Therriault played 'O, Canada' on the piano, joined by the voices of everyone who filled the hall. The sounds of the Last Post filled the hall before the artillery blast, when two minutes of silence was observed. The hall was still while many individuals had private thoughts about family, loved ones, freedom, peace, and war. Then Reveille was played, the traditional wakeup call, and everyone resumed their seats. A prayer was said by local Legion #43 Reverend Dave Goff. Lt. Commander Pierre Comeau introduced Brigadier General Lawrence Aitken. both as a colleague from when they served together in the Congo in Africa 10 years previously, and as a friend. Comeau referred to their time in the Congo as "The largest UN peace keeping mission on earth." Brigadier General Lawrence Aitken has attended many Remembrance Day services. he said of Pincher Creek, "It is kind also clear that this is kind of a special community where honouring veterans is very important." As a communications specialist, he was excellent at getting the message across to those in the hall. "Today, I want to speak a little bit about why it's so important to remember those who chose to serve." As a soldier he addressed each soldier is an individual, and not merely a statistic. "The world is a dangerous place, Canada is a wonderful place. The cost of keeping Canada a wonderful place is our willingness to participate overseas." Aitken spoke of the Canadian 12 year involvement in Afghanistan. "This was the longest deployment in the Canadian Army's history. In the battle to bring help and peace to the people of Afghanistan, 40 thousand people served. 158 paid the ultimate sacrifice of deaths in theatre, then unfortunately, over another 100 took their own lives back in Canada." Aitken said over 2000 returned to Canada injured, and all will carry with them their own time in war for the rest of their lives. "As you know, Canada was the leader in starting the peacekeepers, in the '56 Suez Canal crisis." He explained that since that time Canad has participated in over 50 peacekeeping missions where over 125,000 Canadians have served. One hundred and thirteen have lost their lives in those actions. Aitken underlined over one million Canadians have served in other actions including the two world wars. "General Eisenhower, the Supreme Allied Commander at that time praised our military by saying, 'The Canadians were equal fighting men to any that I saw, they played their part magnificently.'" He explained the heroism of WWI is mixed with blood, mud, misery and terror. One in ten soldiers who left Canadian soil then did not return. He reminded the crowd those who serve are backed up by those who support. Medical staff, and supply lines are not always staffed by military, yet must be close enough to risk themselves for these actions to have any chance of success. In regards to merchant seamen during WWII he said, "It is almost beyond comprehension to consider what they endured, and the dangerous sea conditions. All the while knowing they were the targets for German subs." Aitken spoke of the challenges to peace that carry on today, and reminded those in the room that each of these cold statistics he spoke of was a real person, with real dreams hopes ambitions, families and loved ones. As are those who currently serve in the Ukraine, or fighting ISIL, or anywhere Canadian military has or will go to try and bring peace. "Just as we owe our veterans gratitude and remembrance, we owe our young people knowledge of this history, and in turn, we call upon them to carry the torch of remembrance." "The next time you pass someone in uniform stop and take a moment to thank then for their service." The first wreath was laid on behalf of bereaved mothers by Sheila Provost. Then one by one, others came to the front to show their respects from the governmental officials. After that individual families were called to the front, then organizations and service groups, churches, schools and unions, and businesses. Sgt. Norman Walker and Service Officer Hal Sigurdson laid the wreaths. Royal Canadian Army Cadets Fort Macleod 2309 and Royal Canadian Air Cadets #859 members helped throughout the ceremony, often bringing wreaths to the front by for those who could not attend. After all the wreaths were laid, local pianist Jackie Therriault performed 'Abide with Me' and 'God Save the Queen'. Groups were invited to join the March Off of the colours after the Colour party had made a circuit of the room, making a beautiful tribute to those that serve our country. After the ceremony many went to the Legion to visit and spend some informal time together.